Parts of this book might have been written by the American couple deliberately run over by a car driven by alleged ISIS supporters in Tajikistan this summer. That was tragic; happily this book’s author is alive and well. An immersive and keenly observed debut, it is about a Canadian young woman who could not sit still. With a degree in science and a Rhodes scholarship to Oxford, she disliked spending her days in a laboratory so much that she turned herself into an explorer. It is as thrilling to read about her ascents with a friend into the 16,000 foot peaks in Central Asia on a bicycle as it is scary to imagine trying such a feat oneself. 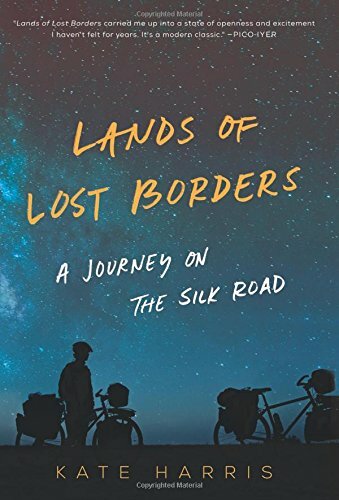 Harris’s book is about the journey along Marco Polo’s Silk Road—from Turkey thru the “Stans” of Central Asia to Tibet and Western China. More important, she feels each moment, physically, emotionally, and spiritually. Her North Star is the North Star, yet it is also Mars, to which as a child she longed to visit. She invokes Darwin, Carl Sagan and other scientists, alongside earlier wanderers like Alexandra David-Neel, Fanny Bullock Workman, and Wilfred Theisiger. The women camped out along stark boulders, had some awful train rides they had to make to get places the bikes would not go, and some exciting moments when they snuck across Chinese border crossings to get into Tibet without papers. Harris makes the point that armies had guarded the high altitude wastes of the border between Tajikistan and Afghanistan (they did not cross into the latter)—dying of cold and suffering altitude sickness—for years, for no reason except politics. The author also notes that Marco Polo was no great adventurer so much as he was a merchant in search of profit, and that Darwin, after his voyage on the Beagle, spent the rest of his life comfortably at home in England. The high point, literally as well as figuratively, is when the two cyclists travel across the forbidden lands of Tibet. They mask themselves like other two-wheel travelers so they won’t be stopped. They rode with red flags on their bikes. They hated the disguise but it was necessary to look like the Chinese. Two disappointments: there are no photos in the book. More consequentially, the single map on the title page is inadequate. It is hard to follow their journey. Nevertheless, we are so lucky that this “freelance explorer” has left us an uncompromising, breathless record of her Eastern excursion.